The Long Island Wine Council estimates that 1.2 million people visited Long Island wine country last year. The Finger Lakes Wine Country promotion group estimates that 750,000 visited wineries in that region. And according to the New York Wine and Grape Foundation website, there were nearly 5 million total visitors to New York wine country in 2008. That's a lot of people tasting -- and hopefully buying -- a lot of New York wine. Empire State Cellars has the potential to dwarf that exposure when it opens later this summer at the Tanger Outlet Center in Riverhead. "Incredibly, the Tanger Riverhead Outlet mall sees five million cars (per year). That’s about fourteen million shoppers a year -- from Long Island, Manhattan and beyond -- with a startlingly high demographic and propensity to make purchases," said Jim Silver, general manager of Peconic Bay Winery, which will open the store as the second of it s five permissible tasting rooms under its Farm Winery license. Satellite tasting rooms are nothing new, of course. They are increasingly common in the Finger Lakes and Pindar Vineyards on the North Fork has a second tasting room in the village of Port Jefferson to take advantage of the tourist traffic there. This is much more than just a satellite tasting room, however. Under New York SLA rules, Peconic Bay Winery can sell not only its own wines at Empire State Cellars, but cider, spirits and other wines from any winery as well -- as long as it is New York AVA products produced in New York State. Empire State Wines will sell all of the above. "We would also like to include New York cheeses and food crafts as well, but we might not have that at first," Silver added. "We intend to represent the very best the state has to offer, as well as great values -- since this is an outlet store -- at competitive prices," he said. The store will stock wines from every corner of New York wine country -- Lake Erie, Thousand Islands, Adirondacks, Hudson Valley, Niagara, Finger Lakes and Long Island. "We will try to represent any New York producer that wants to be in the store," Silver said of the planned selection. The store will also stock multi-vintage verticals of select wines as well as older wines, when available. Any winery represented in the shop will also have the opportunity to pour at scheduled daily in-store tastings. "If a Finger Lakes winemaker is visiting the area, we may schedule them for the day, and maybe the next day have someone from the Hudson Valley pouring his baco noirs and the next day maybe a Long Island winery will pour new releases," Silver said. The concept for Empire State Cellars isn't a new one, of course. There are and have been wine shops that focus on New York wines or feature large New York selections -- most famously the now-closed Vintage NY stores in Manhattan and New Paltz. When I asked Silver where he thinks his concept will succeed where others haven't he said it's largely about timing. "There’s a growing interest in New York wines that is unprecedented so I think the time is right for this type of store. There’s no Jack Daniels, no Smirnoff, and no Cavit Pinot Grigio in this store. We have to exist on people’s growing interest in the local wine and the local economy too. It’s not going to be easy I’m sure, but with the support of the industry behind us we should all do well." The new shop will be run and managed independently of the winery by Polly Brown (picture right with Silver and assistant manager Evan Ducz), the shops operations director. "She has a great depth and diversity of experience in the wine, spirits and food industries -- most of it in Napa. Polly is charged with handling the selection and the marketing of all of the wines, and is strictly independent," Silver said. The "local" angle of the shop isn't just about the products it will sell -- it extends to how they sell them as well. 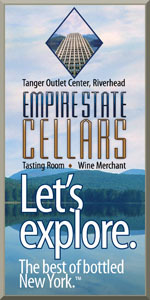 According to Silver, Empire State Cellars will feature “home-grown” shelf-talking reviews and descriptions of wines and spirits as well. "The reviews and write ups from the New York Cork Report, the New York Times and Wine Spectator magazine -- which is a New York company -- will be the predominant reviews on the shelf." It's only one shop, however, but I think the impact could be large. Empire State Cellars has the opportunity to do something that I don't think has been done before -- bring the quality message, the quantity message, the value message and the diversity message all together in one well-curated store -- and present it to millions of people. That New York produces wine, cider and spirits isn't news these days. But when people have the opportunity to experience all the best, all in one room -- and that is the goal here it seems -- it can completely change the way the state's artisan beverages are perceived. Plus, this isn't just a marketing vehicle or a one-time even or yearly festival. It’s like a farmer’s market devoted just to wine -- that is open every day. I think it can, and will, sell a lot of wine. 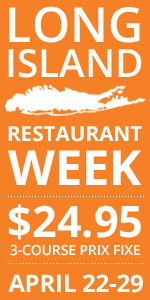 And if you are on Long Island and interested in local wines -- there may be no better place to explore and learn. Brown hopes to work with all of the state's top producers -- even those without distributors. That means that Empire State will likely be the only place on Long Island to get many of these products. As a "local" geek, I'm really looking forward to that. Silver and Brown hope to open the shop on August 1 (but with all the licensing involved, there isn't a firm date yet). For those familiar with the Riverhead Tanger Outlets, the store will be located next to the food court and will essentially share a parking lot with the Ralph Lauren outlet store. "We’re interested in knowing what the wineries would like us to carry – to get the conversation started. Once we’ve heard from you we’ll get back to you with our thoughts, terms and policies and let you know when we will start taking samples. We also need to figure out a mechanism to consolidate product in the various regions so we can pick up wine and bring it down here. Of course the Long Island wineries will be able to bring us their stuff regularly, but we’d like to have pick up points in the Finger Lakes and other regions so our truck can bring them down to the store. Since these sales will be bond-to-bond we cannot take deliveries from distributors. All sales will be direct. I can tell you I’m personally looking forward to getting my hands on some Roanoke, Anthony Road, Weimer, Paumanok, Shinn, Lucas, Channing, Ravines, Sheldrake, Hearts and Hands, McKenzie Rye, wow, the list really goes on and on!" We know that our NYCR readership is extremely passionate and knowledgeable about New York wines, so let's let Silver, Brown and the Empire State Wines team know the producers that we'd recommend. I'm already planning a long email of my own recommendations. I'm sure your list will include those wineries that don't send you samples. Silence: Of course it will. Thanks for commenting, be it anonymously. Based on your IP address, you're in government, so maybe you need to be careful with what you say publicly. I was a fan of Vintage NY before I was into wine...boy, do I miss that shop! Are there plans to expand Empire State Cellars elsewhere than the East End? We applaud Jim and Peconic Bay on their new endeavor and wish them much success in the future. These types of stores are vital to the growth of the New York wine industry and we look forward to seeing a Finger Lakes presence on Long Island. Many other regions have regional and cooperative tasting rooms and retail outlets, and given the success in these other markets, I expect more of these venues will open throughout New York in the coming years. Cheers to New York wine! This is a wonderful opportunity for NY Wines. I applaud Jim for taking this step. This fills a huge void left after Vintage NY closed. I hope to see other locations open up strategically throughout NY. Super exciting! Congratulations to you. Most beneficial to NY wine. Would love to see several of these in the state, helping to sell NY wine and not Wine in Supermarkets!